Put on your red shirt and press play on the playlist – The Starship is now boarding! You can read all about it here, but I wanted to give you a bit of a backstage pass into what it is and does. . NOTE: The Starship only opens once a quarter*, in order to make sure everyone gets started from the same place (and to ensure that I have time to get to know everyone and their business). *To keep it small + personal (so you can connect, collaborate and befriend each other) only 16 new Captains will beam up this quarter (to join the 70+ who are already aboard). After that, boarding closes until December! The Starship is a place for weekly accountability, monthly review and anytime-you-want-it question-asking (and answers!). Over the last 5 years (! ), it’s grown to be more awesome than I had ever imagined. reminds you of your successes. I think of The Starship (and my role in it) as a vessel of celebration (pun intended!). It holds our joys and our challenges and, when we need it most, The Starship reminds us of what we’re capable of. shares expertise. Whether you’re writing a press release or looking for the right platform for your next product, we’ve got members that have done everything from knitwear design to public relations, from self-publishing to traditional publishing, from selling art at gallery shows to teaching at major industry events. If you’ve got a question, we’ve either got the answer, or can find a resource that does. equips you to reach your goals. Whether your goal is about your income, your direction, or the way you work – we have a library full of tools to help you first get clear on your goal, and then work towards it. The most important thing is that you’re going where you want to go, not just where you think you should go. holds you gently accountable. Once you’ve got your destination, we check in regularly to make sure you’re moving towards it. But this isn’t imposing or judging – you let us know what you want to accomplish in the next week, and then you show up to let us know if you did it or not. If you’ve met or exceeded your plan, we throw confetti and celebrate. If you’ve fallen short and are feeling bad, we encourage you. We remind you of your past successes. We’ve always done the weekly group check-ins, but this quarter we started something new: Accountability Partner Pairing. If you want more personal accountability, you just sign up and I hand-match you with a partner. Together you work out when (daily, weekly, monthly?) and how (phone, text, email) you’re going to check in. The results so far have been STELLAR, with lots of progress being attributed to the new partners! 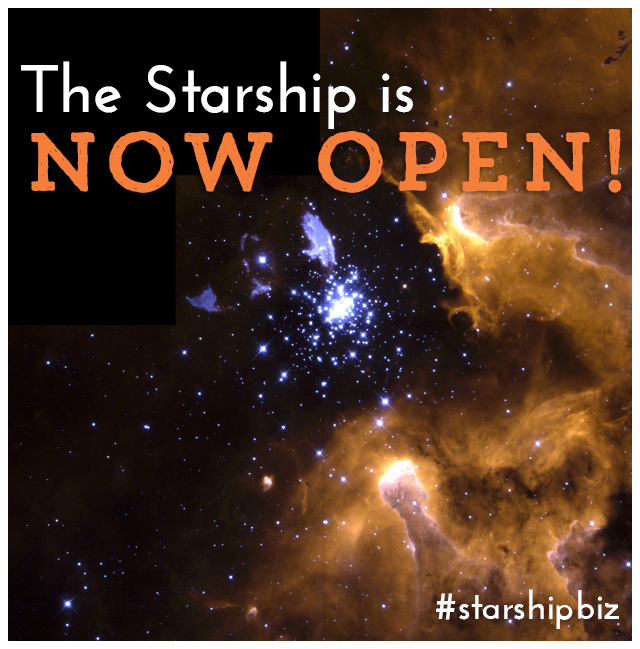 The Starship with @TaraSwiger is now OPEN and accepting new creative biz owners, woot! If this sounds wonderfully appealing, you can read more about The Starship (and join!) here.